Bigelow Exclusive –This limited edition tin features a merry & bright holiday pattern designed by Kate D. Spain, the designer behind the KD Spain brand. 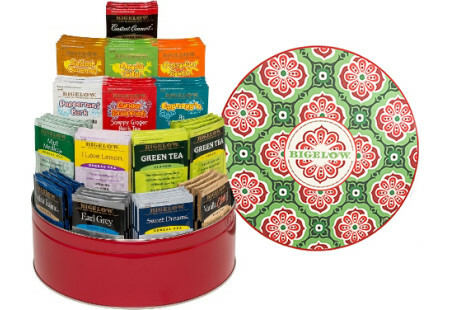 This tin contains 15 different flavors, an assortment of some of our best blends that are sure to please every tea lover. You’ll receive 120 individually wrapped black teas, green teas, herbal teas and holiday teas. And when you’ve enjoyed all the tea, you can reuse the designer tin. Refill it with tea or your favorite keepsakes. Tea selection may vary.